Class Act. France's breakout film star has gone from the banlieues to the big time. If you drive North out of paris toward Charles de Gaulle Airport, the city's grand buildings and boulevards give way to high-rise housing projects that stretch on for miles, sealed off from the highway by concrete barriers. Dominated by Arab and African immigrants and beset by high unemployment rates, these working-class suburbs, or banlieues, rarely get a big-screen closeup. But one of them, Bondy, is now immortalized in France's megahit comedy The Intouchables, about the unlikely, life-changing friendship between a rich white quadriplegic and his poor black caregiver from the banlieues. Filmed partly in Bondy, The Intouchables is the highest-grossing French movie of all time; an estimated 1 in 3 people in France has seen it. Budgeted at just $12 million, the film has raked in more than $340 million worldwide--it was the No. 1 movie in Germany for nine weeks straight--and the Weinstein Co. opens it in the U.S. in limited release on May 25. For some residents of Bondy, the movie's enormous success transcends profit. "I cried when I saw the film, because this is where I am from," says Youness Bourimech, a local entrepreneur whose Moroccan parents raised him in one of Bondy's aging projects and who has seen the film four times. "It shows that it is possible to come from the banlieues and make something good of your life." 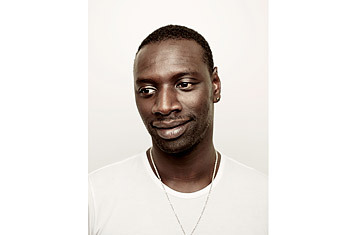 No one captures that sense of possibility as vividly as the film's lead actor, Omar Sy. He plays Driss, an ex-convict of African descent who, as part of his new job, goes from living in a cramped, drafty apartment with his immigrant family to a sprawling mansion on Paris' Left Bank, where he sleeps under a Renaissance painting, tears around town in a Maserati and conspires to find a love interest for his disabled employer, Philippe (Franois Cluzet). Sy, 34, commands The Intouchables with his rapid-fire banter, devil-may-care nerve and live-wire physicality. In February, he became the first black man to win the Best Actor Csar, France's equivalent of the Academy Award, beating out The Artist's Oscar-winning Jean Dujardin. Sy is perhaps France's biggest black star--and becoming one of its biggest stars, period. For Sy (pronounced See), Driss was an intimately familiar figure and, he says, a "bittersweet" one. The fourth of eight children, Sy grew up in an impoverished housing project west of Paris in Trappes, home to thousands of African and Arab immigrants. His Senegalese father worked in an auto-parts factory; his mother, newly arrived from Mauritania, cleaned office buildings, just as Driss's aunt does in the film. "There are two Frances that exist side by side," Sy says over coffee one morning in the office of his wife, a publicist, in Paris' tony 16th arrondissement. "For me, it was only when I started to work that I saw the other France, that I heard other ways of speaking. We always knew it existed. But we didn't ever see it."